A-1 Racing Products offers racecar suspension components, suspension tubes, coil-over kits and more. Aluminum Suspension Tubes are have a machined wrench flat on one end for ease of adjustment. Tubes are ideal for a number of uses. Tubes are 1" in diameter, . 156" wall thickness and both ends are tapped 3/4", one RH and one LH. Koni Coil-Over Kits are available for all popular Koni Shocks. Whether you need a kit for a Koni threaded body shock, or you are converting a smooth body shock for coil-over use PitStopUSA.com has the Koni Coil-Over Kit you need. Monroe Coil-Over Kits from PitStopUSA.com are available for converting a smooth body shock for coil-over use. Pit Stop USA is The Online Motorsports Superstore! 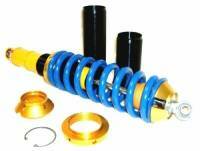 We feature Pro Shocks Coil-Over Kits at low everyday prices. Pit Stop USA is The Online Motorsports Superstore! We feature QA1 & Carrera Coil-Over Kits at low everyday prices. Steel are aluminum bushings reduce the rod end pivot ball I. D. to accept a smaller bolt size. Pit Stop USA is The Online Motorsports Superstore! We feature Torsion Bar Bushings at low everyday prices. Unthreaded aluminum Suspension Tubes are are ideal for a number of uses and allow for custom fabrication of suspension components. Wheel Adapters are available in a variety of configurations to adapt wheels to different bolt circle patterns. NOT FOR USE ON STREET VEHICLES. Pit Stop USA is The Online Motorsports Superstore! A-1 Racing Products offers a wide variety of Coil-Over Kits, Race Car Suspension Components, Oval Track Suspension Components, Suspension Tubes, Rod End Bushings, Torsion Bushings, Aluminum Wheel Adapters, Late Model Bird Cages, Bearing Style Bird Cages, Hub Bearing Kits and much more! We offer A-1 Coil-Over Kits, A-1 Race Car Suspension Components, A-1 Oval Track Suspension Components, A-1 Suspension Tubes, A-1 Rod End Bushings, A-1 Torsion Bushings, A-1 Aluminum Wheel Adapters, A-1 Late Model Bird Cages, A-1 Bearing Style Bird Cages, A-1 Hub Bearing Kits and more at low everyday prices!